2019-W quarters from the West Point Mint are popping up in circulation. They could turn up in your pocket change any day! When they began hitting the streets in April 2019, the numismatic community took note. In fact, one popular coin firm offered $5,000 to the first person to turn one in. Other coin dealers offered hundreds of dollars, too. Why are these 2019 America The Beautiful Quarters so scarce? And why are they worth possibly hundreds of dollars? What Makes These 2019 Quarters So Unique… And Scarce? The folks at the United States Mint are always trying new and exciting ways to get more coin collectors into the hobby. For National Coin Week 2019, many coin dealers sprinkled more than 1 million collectible coins into circulation. They called the effort The Great American Coin Hunt — it was designed as a Willy Wonka style treasure hunt! With 2 million W-mint quarters for each of the 5 designs in 2019, that’s a total of 10 million 2019-W quarters. While 2 million specimens of each 2019 America The Beautiful quarter may sound like a lot, consider this: the mintage of 2 million for each type of 2019-W quarter is the lowest for any regular-strike circulating quarter since the 1937-S Washington quarters (made to the tune of just 1,652,000 pieces). If that’s not enough to rev you up about these 2019 W-mint quarters, then consider this cool fact: these are the first circulating business-strike coins bearing a “W” mintmark from the West Point Mint. NOTE: These new quarters are the first circulating business-strike coins to have the “W” mintmark — but they aren’t the first coins struck at West Point for circulation. In the 1970s and ’80s, the West Point Mint made millions of Lincoln pennies and Washington quarters for circulation without a mintmark, making them indistinguishable from Philadelphia-minted examples! How Much Is A 2019-W Quarter Worth? The 2019-W quarters were worth quite a bit in the weeks immediately following their release. As mentioned earlier, many coin dealers and other numismatic firms offered bounties on the first examples to be turned in at their businesses. Perhaps most famous of all is the offer by third-party coin-grading firm Professional Coin Grading Service (PCGS). They gave $5,000 to the first person to submit a 2019-W quarter to them for grading. Several coin dealers stepped up with similar offers ranging from $100 to $1,000 for first examples of the 2019-W quarters. Other coin dealers offered as much as $20 per quarter — regardless of the quantity or if they were the first submitted. Worn examples of 2019-W quarters are likely to fetch between $3 and $5 apiece. Uncirculated pieces should remain fairly valuable at $10 to $20+ each. Part of the reason these coins are worth so much more than face value is the fact that there are relatively few to go around a nation of more than 325 million people. 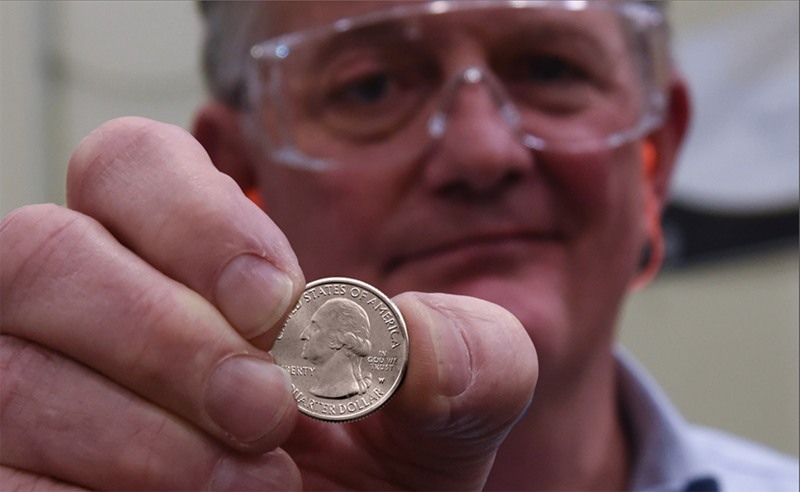 It’s possible to find a 2019-W quarter in your pocket change or among the coins you get from, say, a vending machine. But most of the diehard collectors who are looking for these coins will be searching through rolls of quarters from banks — and you can, too! US Mint officials sprinkled 2019-W quarters into regular bags of quarters going out in shipments from the Philadelphia and Denver Mints. These bags went to Federal Reserve banks and some major private-sector banks. That means your best bet is to search through bags and rolls of 2019 quarters. Even after 2019, you’ll still want to search through your loose change and quarter rolls looking for these 2019 quarters — because many of the 2019-W quarters will re-enter circulation by numismatically unknowledgeable individuals who receive these coins and later spend them.